Jean de Brunhoff was the creator of the Barber books back in 1931 and lived for a while in a small town on the French Riviera called Saint Maxine. 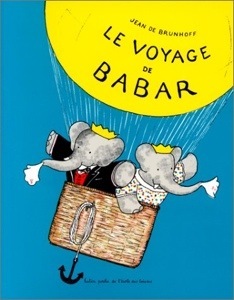 In his book he sent Barber to the big city to learn the “benefits” of civilisation which the elephant then took back with him to the jungle. Nowadays we might find that idea quite amusing, to say the least. We might also find it quite offensive as some said it could be interpreted as a justification for colonialism. Why does Barber wear clothes for example? I hope we have moved on since 1931. 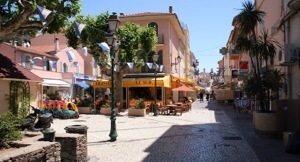 Saint Maxime (above) is situated between St Tropez and Frejus and looks a very attractive town by the Mediterranean. 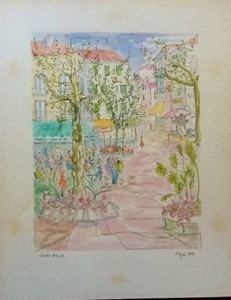 This next watercolour is signed Eykyn and dated 1988. The title is Sainte Maxime and it is beautifully drawn and painted. It conjures up the sight and sounds of a busy French town – very atmospheric.